Starting off by enlisting the help of one of our (somewhat) capable woodworking friends. Every year we have this buddy fab up some feet platforms out of wood for us, but instead of the usual slabs of 2×4’s bolted to the wearer’s shoes, this year we’re going for a smarter build. Literally smarter – flashback to high school trig when we were trying to figure out the angles for the wood. The idea is basically a right triangle on its side, with my partner’s shoes bolted to the hypotenuse. You’d think it’d be a simple thing to make, but unfortunately for us wood has thickness, which throws off the angles and lengths we had originally planned. In some cases certain angles just couldn’t be achieved because our woodworking friend’s saw could only cut angles up to a certain degree. Every year a pair of sneakers are sacrificed to the cause, but as my partner notes they’re always year-old pairs and it gives him reason to get new ones. It’s unorthodox, but kind of genius. Most Gundam cosplays (including our own previous ones) suffer from a large feet problem because the platforms used are always giant slabs of wood that offer comfort and stability while boosting the wearer to a more costume-appropriate height. Nails + wood glue = unbreakable. They ended up not being built perfectly to our desired spec – as evidenced by the janky slope of bondo on one unit and the extra wood slab on the other. So many brackets it looks like an old school war machine. 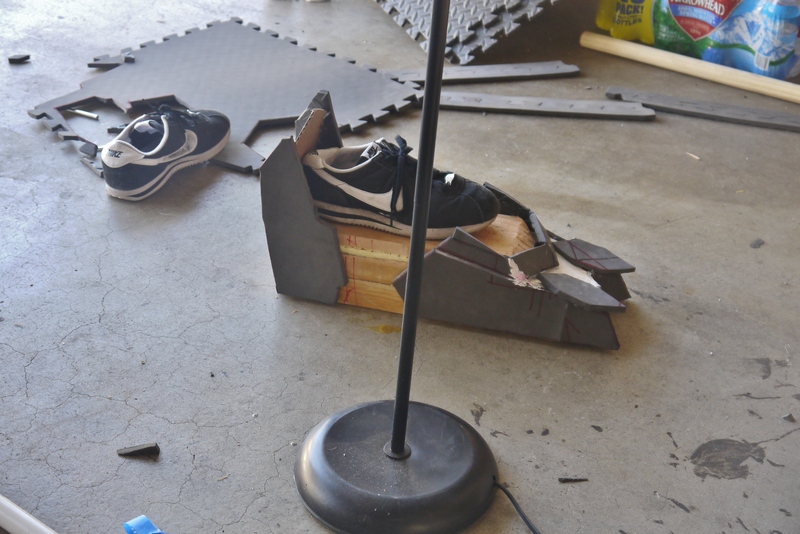 The mating surface between the shoe and wooden booster will also be filled in with some healthy servings of E6000 adhesive, just to make sure this stuff survives the apocalypse if necessary. Basically Gundam heels. But they keep the feet tight and small, without looking disproportionately large as so many cosplays do. I’m finishing up the legs by throwing together the last trim pieces for the blue armor behind the knee. These vent-like trim pieces look a bit large for what they’re supposed to be, but I’m hoping it’ll successfully fill out the otherwise thin legs. I went out of my way to cut all these strips as trim pieces for some of the leg armor when I realized I could’ve just cut out part of the leg armor itself and staggered it to achieve the same effect. D’oh! Our two original glue pots also unfortunately bit the dust – contact cement is kind of savage like that. Thankfully for less than $5 we had a new set, epoxy and all. Using elastic to put together the straps that will hold the arms to the wearer’s body. Elastic gets sized and wrapped around the cardboard, which is then inserted and glued into the armor. Everything is sandwiched inside with a generous mixture of E6000, hot glue, and staples. It’s not going anywhere. Moving on to the faux condensers on the legs – the round concave pieces of armor opposite the clear green piece on the suit. To save myself trouble I decided to actually use the blank CD/DVD disk in the dome construction. We have plenty where this came from, so it’s no big deal (who actually uses these blank disks nowadays anyway?). Now that most of our core building was done, my partner and I decided it was time to tackle one of the hardest parts of the suit – clear parts. We did plenty of research on clear plastics and all sorts of wacky transparent materials that could potentially become useful as GN Condensers, but at the end of the day the most affordable and attainable stuff came straight out of our local Home Depot – a large $40 sheet of clear acrylic. We got the thinnest plate we could (mostly to save costs) and also to make cutting and forming it a bit easier. At first we picked up a scriber tool specifically meant to cut clear acrylic – but it didn’t quite work as well as advertised. This thing is supposed to just scribe lines into the material deep enough to the point where we can break the rest off by hand. When the scriber wasn’t holding straight and cutting deep enough, we resorted to the classic dremel and metal cutting saw wheel. The point of the acrylic is to heat-form it over a mold so it forms a concave dome. One of our buddies owns a 3D printer and was kind enough to make these pieces for us that join together to form a dome mold the size we needed. I’ve never worked with 3D printed pieces before, so I was surprised to say the least to see this stuff so badly textured and literally rough around the edges. The extra flash at the bottom wasn’t hard to trim off, but getting the surface somewhat smooth so we can heat-form acrylic over it would be a challenge. It sounds simple to just sand the thing down, but the plastic used for 3D Printing is apparently ridiculously hard and durable. We could barely get it down with even the belt sander. Cut out a clear square of acrylic that will now be laid over the mold and heated until it forms the desired shape. It’s harder than it looks. The first trouble lies in the acrylic’s very narrow optimal heat-bending band. If we don’t heat it long enough it won’t bend; if we do it for too long the acrylic will bubble and form some gnarly textures. The hardest aspect by far was the acrylic’s natural unwillingness to bend into a compound curve – everywhere we pushed down a mountain would form on the opposite end. It took a while of this same back and forth until we got something marginally presentable. Placed a blank CD underneath and traced around it for the area we need to cut out. Dremel’d out. I’m actually not brave enough to use the metal saw blade and take it into the acrylic – my partner’s become a master of the art though. Apparently it constantly shoots tiny acrylic shards into his face and skin, and the smell leaves something nasty. Geez we actually did it. No, it’s not perfect, but I like to think that just attempting clear pieces on a cosplay like this is deserving of praise. Once this stuff is painted the edges will mostly be covered when it’s inserted into the suit parts anyway, so the blemishes won’t be too apparent on the final armor. Seeing the curve of the condensers and knowing that we actually made these from scratch instead of looking around for some conveniently round clear bowl or something made it so satisfying. Putting in the domed pieces on the sides of the arms that don’t have the clear green condensers. With the clear domes finished for the legs these units are basically done, or so I like to think. Needed to add a second strap into the arm units because it was a tad too loose with only one. The tighter grip should stop too much rotation of the armor on the wearer’s skin, which is always a problem when the elbows need to match up with the biceps. Partner putting the side skirts together. The shoe boosters work basically the same as high heels – in this case we’re walking on 4 inches of wood out back. My partner’s already reported discomfort and pain in the balls of his feet, though this design is revolutionary in that it allows for a lot more articulation and ease of movement than the giant cumbersome blocks of years past. Quick test fit with what we have so far – we did a walking test with the shoe platforms and it looks to work pretty well, despite all the jankiness that went into its construction. Now it was time for some scarier stuff – remember the glass bowl we got from Goodwill in Part 1 and then promptly smashed (accidentally) in Part 2? It’s finally come time for it to serve its intended purpose, and we figured that holding a heat gun over it when the broken pieces are being held in by hot glue was probably a bad idea, so a healthy layer of duct tape was applied over it to make sure it wouldn’t shatter under our hands during the heat-forming process. Just a tiny bit terrifying heat forming acrylic over glass. Naturally this dome took the longest to hash out, given that it has to have a pretty deep curve to be pronounced enough when it goes in the chest cavity. We actually ended up heating it a bit too long in some areas and ended up with some melted and bubbly textures. Thankfully this was mostly fixed after a good amount of sanding and polishing. Again, not perfect, but close enough. The toughest and largest condenser parts are done – the rest are just smaller circles for the arms. He’s a maestro with that dremel. The scary face wrap is completely necessary, otherwise he’d be breathing and eating acrylic shards. The smaller circles for the arms technically were supposed to have an ever so subtle curve in their shapes, but we couldn’t be damned to replicate such a pointless and tiny detail when it took so much effort to bend domes. Every now and again disaster strikes. This happens when he tries to pop the piece out of the acrylic sheet without making sure all the cuts are clear. Masked with some cheap tape and ready to be sent off for painting. While my partner and I could totally run by our local hobby store and pick up a can of clear green Tamiya paint, our other fellow modeler offered to do these over for us in clear green with his fancy airbrush setup. And fancy it was. Apparently it took some experimenting with the paint mix to get this particular consistency of clear, and while it’s a bit blotchy it actually ended up looking exactly like the clear green parts I’d paint on model kits. And of course it would be the largest and hardest dome piece that receives a hairline crack for whatever reason. You’d have to run over our dead bodies with a Zamboni and send us to Hell and back before we make another one of these over the broken glass bowl, so we’re shipping this even with the crack. It’s barely noticeable unless you hold it up to the light anyway. We forgot that there are clear condensers in the head too, so those empty spaces need to be traced onto cardboard, which will then be traced onto the acrylic. Quite a bit just for the head, but this is par the course for these 00 designs – clear green everywhere! I then realized I had made a grave mistake after my partner had cut out the first bit that goes into the ear area – looks like I had misjudged the sizing just a tad. Unfortunately this meant we needed a whole new piece since the old one wasn’t long enough to fill the area completely – he wasn’t happy about that. It actually ended up being because I used the original ear cut-out template to trace onto the acrylic, when in reality that old template was no longer reliable since I had made changes to the ear design on the head. Oops? Forehead crest looks sick. The bottom piece was actually also heat-bent by just using the corner of a table and prying the triangle part down. Partner continuing work on the skits – he even went out of his way to add the bevels on the edges of the sideskirts via dremel. Very impressive stuff. They look silly until they come together. Meanwhile I need to tackle the feet – it’s actually remarkably impressive how small we can keep them this year thanks to the heeled block design. The design is actually pretty simple and easily broken up into foam parts, but the process is rather tedious. Tight tolerances here because I want to keep it as form-fitting as possible. Compare it to last year’s feet and it really is a staggering difference in size and bulk. Now I run into issues for my trouble attempting to keep the feet tight. That unsecured rectangle at the top of the design is what’s supposed to go in to keep the design accurate to the model kit. Unfortunately, it’s not really possible to put that rectangle in since my partner’s actual feet will stretch the shoe and make it impossible for a part like that to work. So I have to compromise and make the triangle a trapezoid instead. It actually doesn’t look bad at all – completely natural in fact – but the fact that it isn’t wholeheartedly accurate to the original design is always going to eat away at my fragile heart. The final design looks super cool and super solid in my opinion. Gunpla has seen a design trend in recent years where mobile suit feet have gotten smaller and smaller – we’re simply following the fad here. Partner mocking up the backskirt in the meantime. And translated smoothly into foam. My buddy now needs to work out the final kinks in the chest cavity. Now that we have the clear green dome that goes in the chest, it needs a bezel to fully integrate into the cavity and work with the rest of the design. It’s a bit tough to design a cone shape to accept the dome though, so my partner’s working some crazy paper shenanigans. He basically made a snow cone and cut out the upper strip to make the chest bezel. If it works, it ships. Translated from paper to foam and it actually looks really good! Squished into the chest cavity so it looks more oval than circle as it should be. A long and thick strip of foam is then wrapped around the base of the bezel to form the GN Drive cylinder, which will glue into the chest cavity. Nearly there. Just need to remake that curved piece that goes on top of the cockpit hatch and meets flush with our new chest cavity bezel. Before we get to a full test suit-up, my partner can’t be wearing navy blue shorts with his black morph suit – it would stick out like a sore thumb. So instead of being normal people and going out and buying a pair of black shorts to use with the cosplay, we decided to take some leftover black spray paint to the original shorts and have it colored to our needs. Given that I can’t even get regular acrylic paints out of my clothing when it gets on it by accident, this deliberate spray painting should hold up pretty well. And finally that absolutely kickass near-full suit-up. The skirts all still need to be strapped in properly (they’re being held in with makeshift painter’s tape for now just to see the fitment) and some movement kinks still need to be worked out with the legs, but for the most part this is it. No exaggeration to say that armor like this makes you feel powerful. The base mobile suit is about 90% of the way there – most of it can even be painted soon. The final boss is always the most difficult to face though, and in our case it would be the shield and all the associated gimmickry that comes with it when we try to attach that giant assembly to our skinny form-fitting suit. Good thing we’ve done a giant over-the-shoulder suit accessory before though.